Brian Percival เข้าชิงรางวัล Oscar, Golden Globe และ BAFTA ชนะรางวัล Grammy สาขา Best Instrumental Composition. ↑ "John Williams, el compositor de la aventura". Revista Esfinge. สืบค้นเมื่อ 2012-04-30. ↑ 5.0 5.1 Sony Classical Williams Biography ที่ เวย์แบ็กแมชชีน (archived ตุลาคม 12, 2007). at www.sonybmgmasterworks.com; retrieved September 29, 2007. ↑ Barrett, Heather (2015-09-30). "Star Wars composer John Williams' first score a 1952 Newfoundland film". CBC News. สืบค้นเมื่อ 2015-12-31. ↑ Barton, Tom. A Musical Biography of John Williams. สืบค้นเมื่อ 2015-12-31. ↑ Casey, Dan (2015-11-01). 100 Things Star Wars Fans Should Know & Do Before They Die. Triumph Books. ISBN 1633193454. สืบค้นเมื่อ 2015-12-31. ↑ 14.0 14.1 14.2 14.3 14.4 14.5 14.6 "Academy Awards and Nominations". John Williams Web Pages. สืบค้นเมื่อ 2015-12-31. ↑ "'Star Wars Episode 7': John Williams Will Probably Score the Sequel, According to J. J. Abrams". Moviefone. 2013-05-01. สืบค้นเมื่อ 2015-12-31. ↑ Richards, Mark (2015-11-30). "Celebrating Star Wars Themes Part 4". Film Music Notes. สืบค้นเมื่อ 2015-12-31. ↑ Richards, Mark (2015-11-30). "Celebrating Star Wars Themes Part 5". Film Music Notes. สืบค้นเมื่อ 2015-12-31. ↑ Richards, Mark (2015-11-30). "Celebrating Star Wars Themes Part 6". Film Music Notes. สืบค้นเมื่อ 2015-12-31. ↑ "The Adventures of Tintin: The Secret of the Unicorn (John Williams)". Filmtracks. สืบค้นเมื่อ 2012-04-30. ↑ "War Horse (John Williams)". Filmtracks. 2011-11-21. สืบค้นเมื่อ 2012-04-30. ↑ "The Adventures of Tintin: The Secret of the Unicorn (John Williams)". Moviecues.com. 2011-11-01. สืบค้นเมื่อ 2012-04-30. ↑ "War Horse (John Williams)". Moviecues.com. 2011-12-04. สืบค้นเมื่อ 2012-04-30. ↑ "The Adventures Of Tintin: The Secret Of The Unicorn – John Williams". Moviemusicuk.us. 2011-10-23. สืบค้นเมื่อ 2012-04-30. ↑ "The Adventures of Tintin: The Secret of the Unicorn soundtrack review". movie-wave.net. สืบค้นเมื่อ 2012-04-30. ↑ "Winners for the 84th Academy Awards". Oscars.org. สืบค้นเมื่อ 2012-04-30. ↑ "2013 Academy Award Nominees Announced". mediaite.com. 2013. สืบค้นเมื่อ 2013-01-10. ↑ "Williams confirms he will score Episode VII". jwfan.com. 2013-05-23. สืบค้นเมื่อ 2013-05-23. ↑ "Oscar Nominations 2016: Star Wars: The Force Awakens". oscars.go.com. 2016-01-14. สืบค้นเมื่อ 2015-01-14. ↑ "Thomas Newman Replaces Williams on "Bridge of Spies"". jwfan.com. March 18, 2015. สืบค้นเมื่อ March 18, 2015. ↑ "Williams, John biography". สืบค้นเมื่อ May 6, 2007. 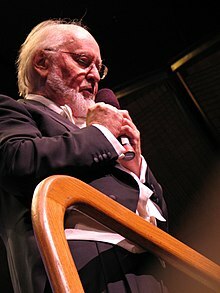 ↑ "John Williams Film Music Box Biography Discography News". Archived from the original on September 27, 2007. สืบค้นเมื่อ May 6, 2006. ↑ "AFI 100 Years of Film Scores". Web.archive.org. 2007-10-22. Archived from the original on 2007-10-22. สืบค้นเมื่อ 2011-09-05. ↑ "John Williams Tapped for 44th AFI Life Achievement Award". Variety. สืบค้นเมื่อ 2015-10-08. ↑ "Boston College Fact Book, 1998-1999" (PDF). สืบค้นเมื่อ August 28, 2015. ↑ "IOC awards the Olympic Order to John Williams". IOC. May 1, 2003. สืบค้นเมื่อ December 19, 2011. ↑ "Remarks by the President at Presentation of the National Humanities Medal and the National Medal of the Arts | The White House". February 25, 2010. สืบค้นเมื่อ July 4, 2011. ↑ "Full cast and crew for Stars Wars Episode VI: Return of the Jedi". IMDb.com. สืบค้นเมื่อ 2013-08-10. หน้านี้แก้ไขล่าสุดเมื่อวันที่ 24 มิถุนายน 2560 เวลา 21:43 น.